Long Island’s Nikon at Jones Beach Theater will play host to pop music festival Billboard Hot 100 Music Festival on August 22-23 (making that a busy weekend with Brooklyn’s Afropunk festival). 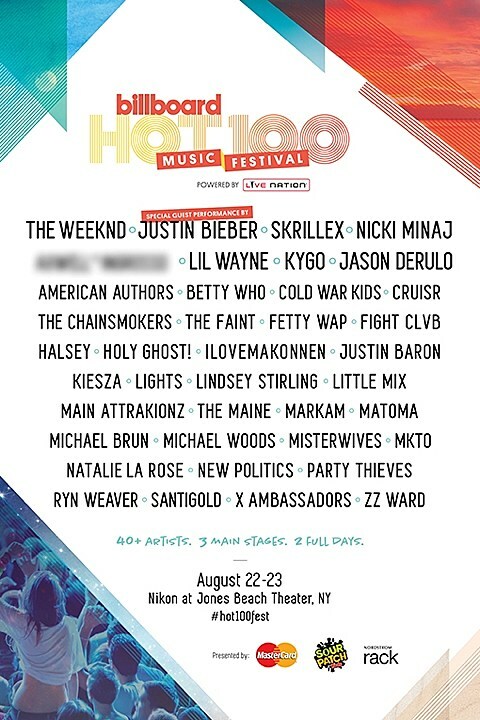 You probably don’t care that Justin Bieber is playing, but depending on how much of a poptimist you are, it’s potentially interesting that they have The Weeknd, Skrillex, Nicki Minaj, Lil Wayne, iLoveMakonnen, Fetty Wap, Kiesza and Santigold. Plus underground rappers Main Attrakionz and, weirdly enough, indie-dance bands Holy Ghost! and The Faint. Tickets go on sale Thursday (7/16) at 10 AM with a Citi presale starting Monday (7/13) at 9 AM. Full lineup (with one more TBA) below. The fest is a week before Fetty Wap returns to the venue to open for Chris Brown (sigh), and about a month after Nicki Minaj’s big Barclays Center show with Meek Mill, Rae Sremmurd, Tinashe and DeJ Loaf.